An in-depth report on the causes, diagnosis, treatment, and prevention of carpal tunnel syndrome. Carpal tunnel syndrome (CTS) is a disorder that causes pain and weakness in the hand and wrist. In general, carpal tunnel syndrome develops when the tissues around the median nerve of the hand swell and press on the nerve. Some research suggests that this swelling is caused by a buildup of fluid (called synovial fluid) under the lining. Anyone with recurrent or persistent pain, numbness and tingling, or weakness of the hand and wrist should consult a doctor for an evaluation. Early in the disorder, the process is reversible. Over time, however, permanent nerve damage may develop. Although some studies have suggested that over half of CTS cases are associated with workplace factors, most studies now indicate that CTS is primarily associated with medical or physical conditions such as diabetes, osteoarthritis, hypothyroidism, acromegaly, sarcoidosis, and rheumatoid arthritis. Women have a significantly higher risk for carpal tunnel syndrome than men. Older, overweight, and physically inactive people are at higher risk. It is important to begin treating early carpal tunnel syndrome before the damage progresses. A conservative approach to CTS, which may include corticosteroid injections and bracing, is the first step in treating this disorder. Surgery is usually an effective treatment choice for people with the more advanced signs and symptoms of carpal tunnel syndrome who do not recover after conservative treatment. Carpal tunnel syndrome (CTS) is a disorder that causes pain and weakness in the hand and wrist. CTS develops from problems in a nerve in the wrist -- not the muscles, as some people believe. The symptoms of CTS can range from mild to incapacitating. To understand how CTS arises, it is important to know the parts of the hand and wrist that are involved.
) that form an arch below the tunnel. The median nerve plays two important roles. It supplies sensation to the palm side of the thumb, index, middle, and ring fingers, and to the flexor tendons. It provides function for the muscles at the base of the thumb (the thenar muscles). 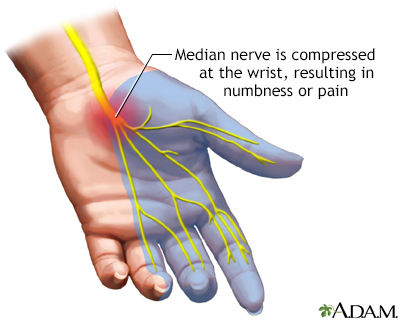 The median nerve travels through a compartment in the wrist called the carpal tunnel. The ligaments that traverse the tunnel are not very flexible. Any swelling within the wrist compartment can put excessive pressure on structures such as the blood vessels and the median nerve. Excessive pressure can constrict blood flow and cause nerve damage. The symptoms from the compression cause pain, loss of sensation, and decreased function in the hand. It is not completely known how the process leading to CTS actually evolves, and how nerve conduction (the transmission of the nerve signal) through the wrist changes. In general, CTS develops when the tissues around the median nerve swell and press on the nerve. Early in the disorder, the process is reversible. Over time, however, the insulation on the nerves may wear away, and permanent nerve damage may develop.
) swells within the carpal tunnel. Some research suggests that this swelling is caused by a buildup of fluid (called synovial fluid) under the lining. normally lubricates and protects the tendons. , the band of fibrous tissue that forms the roof over the median nerve, becomes thicker and broader. The swollen tendons and thickened ligament press on the median nerve fibers, just as stepping on a hose slows the flow of water through it. This compression reduces blood flow and oxygen supply to the nerve, while slowing the transmission of nerve signals through the carpal tunnel. Some cases of CTS may be due to enlargement of the median nerve rather than compression by surrounding tissues. The result of these processes is pain, numbness, and tingling in the wrist, hand, and fingers. Only the little finger is unaffected by the median nerve. Symptoms may occur not only when the hand is being used but also at night when the patient is at rest. Even in cases where work is the suspected cause, symptoms typically first occur outside of work. In fact, the disorder may be distinguished from similar conditions by pain that occurs at night after going to bed. CTS is considered an inflammatory disorder caused by repetitive stress, physical injury, or a medical condition. It is often very difficult, however, to determine the precise cause of carpal tunnel syndrome. No tests are available to identify a specific cause. Except in patients with certain underlying diseases, the biological mechanisms leading to CTS are unknown. Although some studies suggest that more than half of CTS cases are associated with workplace factors, there is no strong evidence of a cause-and-effect relationship. In fact, most studies now strongly suggest that CTS is primarily associated with medical or physical conditions such as diabetes, osteoarthritis, hypothyroidism, and rheumatoid arthritis. CTS also tends to occur in people with certain genetic or environmental risk factors. These risk factors include obesity, smoking, alcohol abuse, or significant mental stress. CTS sometimes runs in families, which suggests that it has some type of genetic origin. When people who are susceptible to CTS are subjected to repetitive hand or wrist work, the risk for CTS can become significant. CTS, then, is very likely to be due to a combination of factors that lead to nerve damage in the hand. Hand-arm vibration syndrome. Tingling and numbness that persist even after the vibration stops. All of these problems are generally associated with repetitive and forceful use of the hands, resulting in damaged muscles and bones of the upper arms. Several medical conditions increase the risk for, or even cause CTS. The main conditions associated with CTS are diabetes, hypothyroidism, rheumatoid arthritis, osteoarthritis, acromegaly, sarcoidosis, amyloid infiltration of the transverse carpal ligament, obesity, and pregnancy. Many of the underlying diseases that contribute to the development of CTS are also associated with more severe forms of CTS. CTS is a very common feature of diabetic neuropathy, one of the major complications of diabetes. Neuropathy is decreased or distorted nerve function; it particularly affects sensation. Symptoms include numbness, tingling, weakness, and burning sensations, usually starting in the fingers and toes and moving up to the arms and legs. About 14% to 30% of patients with CTS have diabetes. Both type 1 and type 2 diabetes increase the risk for CTS. The development of CTS symptoms is related to the patient's age, and the length of time that he or she has had diabetes. In autoimmune diseases, the body's immune system abnormally attacks its own tissue, causing widespread inflammation, which, in many cases, affects the carpal tunnel of the hand. Such autoimmune diseases include rheumatoid arthritis, systemic lupus erythematosus, and thyroiditis, which can lead to hypothyroidism. Some experts believe that CTS may actually be one of the first symptoms in a number of these diseases. Studies also suggest that CTS patients with these disorders are more likely to have severe CTS that requires surgery. Arthritis, gout, and other medical conditions that damage the muscles, joints, or bones in the hand may cause changes that lead to CTS. Inborn abnormalities in the bones of the hand, wrist, or forearm may contribute to CTS. People with chronic kidney disease who are on hemodialysis for a long time often experience beta 2-microglobulin amyloidosis. This condition arises from buildup of a certain type of protein, called beta 2-microglobulin, in different organs, including the joints of the hand. This buildup can result in CTS. The longer the person has been receiving hemodialysis, the greater the risk of CTS. Certain drugs and procedures (particularly a procedure called hemodiafiltration) may be able to reduce microglobulin build-up. According to case reports, many medications may increase the risk for temporary CTS. They include certain medications that affect the immune system (such as interleukin-2) and anticlotting drugs (such as warfarin). The evidence is conflicting as to whether corticosteroids and hormone replacement therapy may increase the risk of CTS. More research is needed before a cause-and-effect relationship can be established. Bone dislocations and fractures can narrow the carpal tunnel and put pressure on the median nerve. Hormonal fluctuations in women play a role in CTS. Such fluctuations may lead to fluid retention and other changes that cause swelling in the body. Fluid retention is one reason that CTS may develop during pregnancy. CTS is associated with a family history of the disorder. Certain physical characteristics or medical conditions that are associated with CTS also run in families. CTS in young people most likely has a genetic component. Other genetic factors that may contribute to this disorder include abnormalities in certain genes that regulate myelin, a fatty substance that insulates nerve fibers. Evidence suggests that about 3% of women and 2% of men will be diagnosed with CTS during their lifetime. The condition peaks in women over age 55. Still, determining how many people actually have CTS is very difficult. Many people who report CTS symptoms have normal test results. Other people have abnormal test results but no symptoms. Older people are at higher risk for CTS than younger adults. CTS is very rare in children. Some studies indicate that women may have a higher risk for CTS than men. The explanation for this greater risk is unknown, but it may be related to the smaller size of a woman's carpal tunnel. Hormonal changes also appear to play a major role in CTS. In pregnant women, CTS may occur in both wrists. CTS that begins during pregnancy is usually not severe and persistent enough to require treatment. Although cases eventually go away on their own after delivery, symptoms may persist for 6 months or more. Women are also at a much higher risk for autoimmune disorders than men. These disorders are significantly linked to CTS. Being overweight is a consistent risk factor for CTS. Greater body mass appears to reduce the speed of nerve messages into the hand. Obesity is also related to poor physical fitness, which may increase risk. Weight is strongly linked to CTS in patients under age 63, but it may be a less important factor as people get older. Workers who use their hands and wrists repetitively are at risk for CTS, particularly if they work in cold temperatures and have factors or medical conditions that make them susceptible to the condition. Repetitive typing and key entry has traditionally been associated with missing work due to CTS. The risk for CTS in this group, however, is still much lower than it is in occupations involving heavy labor. Although more than 10% of computer users complain of CTS symptoms, the evidence implicating computer use as a major cause of CTS is weak. Workers in the meat and fish packing industries and those who assemble airplanes have the highest risk for CTS, according to one study. Meat packers complained of pain and loss of hand function as long ago as the 1860s. Even today, the incidence of CTS in the meat, poultry, and fish packing industries may be as high as 15%. CTS may also affect as many as 10% of automobile workers. Musicians are at very high risk for CTS and other problems related to the muscles and nerves in the hands, upper trunk, and neck. In one study, 20% of musicians reported CTS or other nerve disorders in the hands and wrists. Studies indicate that psychosocial factors in the workplace, such as intense deadlines, a poor social work environment, and low levels of job satisfaction are major contributors to carpal tunnel pain. People who intensively cook, knit, sew, do needlepoint, play computer games, do carpentry, or use power tools are at increased risk for CTS. Long-distance cycling may worsen symptoms of carpal tunnel syndrome. Some (but not all) studies have reported a higher risk for CTS in people with square wrists (the thickness and width are about the same) than in those with the more common rectangular wrists. In one study, patients with palms that were both shorter and wider than average, and who also had shorter third fingers, were more likely to have CTS than those without these hand characteristics. Some researchers claim that poor upper back strength makes people more susceptible to poor posture and injuries in the upper extremities, including carpal tunnel syndrome. Cigarette smoking slows blood flow, which is why smokers have more severe symptoms and slower recovery than nonsmokers. Increased alcohol intake has been associated with CTS in people who also have other risk factors. Poor nutrition, previous injuries, and stress can increase the risk for carpal tunnel syndrome. In addition, high levels of so-called "bad" cholesterol (low-density lipoprotein, or LDL) have been linked to an increased risk of CTS. Carpal tunnel syndrome can range from a minor inconvenience to a disabling condition, depending on its cause and persistence, and the patient's individual characteristics. Many cases of CTS are mild, and when symptoms don't last long, they often get better on their own. Once a woman with pregnancy-associated CTS gives birth, for instance, the swelling in her wrists and other symptoms almost always subside. Proper treatment of the medical conditions that cause CTS can often help reduce wrist swelling. In severe untreated cases, however, the muscles at the base of the thumb may wither, and loss of sensation may be permanent. CTS can become so crippling that people can no longer do their jobs or even perform simple tasks at home. Eventually, workers with CTS may be forced to give up their livelihood. Because of the controversy surrounding the issue of carpal tunnel syndrome and workers' compensation, workers may not always receive compensation payments. Because many factors can contribute to CTS, there is no single way to prevent it. Treating any underlying medical condition is important. Simple common sense may help minimize some of the risk factors that predispose a person to work-related CTS or other cumulative trauma disorders. A patient can learn how to adjust the work area, handle tools, or perform tasks in ways that put less stress on the hands and wrists. Proper posture and exercise programs to strengthen the fingers, hands, wrists, forearms, shoulders, and neck may help prevent CTS. Many companies are now taking action to help prevent repetitive stress injuries. These efforts include modifying equipment, tasks, and processes. Changes in workstations and jobs, as well as buying new equipment may be tried. It should be stressed, however, that there has been no evidence that any of these methods can provide complete protection against CTS. The optimal corporate approach, if possible, is to reallocate workers with repetitive stress injuries to other jobs. Altering the way a person performs repetitive activities and replacing old tools with ergonomically designed new ones may help prevent inflammation in the hand and wrist. Most of the interventions described below have been found to reduce repetitive motion problems in the muscles and tendons of the hand and arm. They may reduce the incidence of carpal tunnel syndrome, although there is no definite proof of this effect. Anyone who does repetitive tasks should begin with a short warm-up period, take frequent breaks, and avoid overexertion of the hand and finger muscles whenever possible. Employers should be urged to vary their employees' tasks and work. Good posture is extremely important in preventing carpal tunnel syndrome, particularly for typists and computer users. The worker should sit with the spine against the back of the chair with the shoulders relaxed. The elbows should rest along the sides of the body, with wrists straight. The feet should be firmly on the floor or on a footrest. Typing materials should be at eye level so that the neck does not bend over the work. Keeping the neck flexible and the head upright maintains circulation and nerve function to the arms and hands. One method for finding the correct head position is the "pigeon" movement. Keeping the chin level, glide the head slowly and gently forward and backward in small movements, avoiding neck discomfort. Poorly designed office furniture is a major contributor to bad posture. Chairs should be adjustable for height, with a supportive backrest. Custom-designed chairs, made for people who do not fit in standard chairs, can be expensive. However, these costs can save companies on the medical expenses that follow injuries related to bad posture. For CTS patients who must use a computer frequently, voice recognition software (Dragon NaturallySpeaking, MacSpeech) may allow virtually hands-free computer use. Anyone who uses a keyboard and mouse has options that may help protect the hands. Adjust the tension of the keys so they can be depressed without excessive force. Keep the hands and wrists in a relaxed position to avoid excessive force on the keyboard. Replace the mouse with a trackball device and the standard keyboard with a jointed-type keyboard. Use wrist rests, which fit under most keyboards, to help keep the wrists and fingers in a comfortable position. Keep the computer mouse as close to the keyboard and the user's body as possible, to reduce shoulder muscle movement. Hold the mouse lightly, with the wrist and forearm relaxed. New mouse supports are also available that relieve stress on the hand and support the wrist. Cut mouse pads in half to reduce movement. Innovative keyboard designs may reduce hand stress. Ergonomic keyboards allow the user to adjust and modify hand positions and key tension. Most have a split or "slanted" keyboard that places the wrists at an angle. Studies suggest these keyboards help keep the wrist in a more neutral position. The force placed on the fingers, hands, and wrists by a repetitive task is an important contributor to CTS. To alleviate the effect of force on the wrist, design tools and tasks so that the wrist position is the same as it would be if the arms dangled relaxed at the sides. No task should require the wrist to deviate from side to side or to remain flexed or highly extended for long periods of time. The handles of hand tools such as screwdrivers, scrapers, paintbrushes, and buffers should be designed so that the force of the worker's grip is distributed across the muscle between the base of the thumb and the little finger, not just in the center of the palm. People who need to hold tools (including pencils and steering wheels) for long periods of time should grip them as loosely as possible. In order to apply force appropriately, the ability to feel an object is extremely important. Tools with textured handles are helpful. If possible, people should avoid working at low temperatures, which reduces sensation in the hands and fingers. Power tools and machines should be designed to minimize vibrations. Wearing thick gloves, when possible, may lessen the shock transmitted to the hands and wrists. Hand and wrist exercises may help reduce the risk of developing carpal tunnel syndrome. Isometric and stretching exercises can strengthen the muscles in the wrists and hands, as well as in the neck and shoulders, improving blood flow to these areas. Performing the simple exercises described below for 4 to 5 minutes every hour may be helpful. Finally, turn your right palm so the thumb-side of the fist is up, and press down again for 5 seconds. Spread your fingers and thumb open while your hand is still bent back and hold for 5 seconds. Repeat five times with each hand. Draw five more counterclockwise circles. Spread the fingers apart, palm up, and hold for 5 seconds. Gently shake your hands limp for a few seconds to loosen them. Repeat frequently when your hands or arms tire from activity. Hold this stretch gently for 5 seconds. CTS is most accurately diagnosed using a medical history, the patient's descriptions of symptoms, a physical examination, and electrodiagnostic tests that measure nerve conduction through the hand. Many people have abnormal electrodiagnostic test results without classic symptoms or any symptoms at all. Furthermore, about 15% of the population has symptoms that are consistent with CTS, but in most of these people, test results do not indicate the disorder. MRI, CT scans, and other imaging tests are not useful for diagnosing carpal tunnel syndrome. Many cases of CTS result from a medical problem that is worsened by repetitive stress factors at work. The patient should give the doctor a detailed history and description of any complaints, in any part of the body. The patient should report in detail any daily activities that require repetitive hand or wrist actions, abnormal postures, or other regular situations that could affect the nerves in the neck, shoulders, and hands. The patient should also report whether the symptoms are more likely to appear at night, or after particular tasks. The use of specific questionnaires that score results can accurately assess the severity of the condition. A diagram of the hand and wrist, usually divided into six regions, is a very useful diagnostic tool. Patients are asked to indicate where their symptoms are, including pain, numbness, or tingling, by locating the affected areas on the diagram. They may also be asked to rate the severity of their symptoms. A diagnosis is probable if at least two of fingers 1, 2, or 3 have these symptoms, and if there is pain in or near the wrist. CTS is possible if at least one of these fingers has symptoms. It is unlikely if there are no symptoms in these fingers, the palm, or the wrist. One of the most important first steps in diagnosing CTS is to evaluate any underlying medical disorders that may be contributing to the condition. Experts emphasize the need to fully examine patients with symptoms of CTS. Relying only on CTS symptoms and personal or work histories may fail to detect (and thus properly treat) underlying medical conditions that could be serious. If the doctor suspects that an underlying medical condition may be exacerbating the symptoms of CTS, laboratory tests will be performed. Tests for thyroid disease and rheumatoid arthritis may be helpful. The doctor may take an x-ray, for example, to check for arthritis or fractured bones. Arthritic conditions, including rheumatoid arthritis, gout, and osteoarthritis, can all cause pain in the hands and fingers that may mimic carpal tunnel syndrome. Any disease or abnormality that affects the muscles and nerves, including those in the spine, may produce symptoms in the hand that mimic carpal tunnel syndrome. About 25% of patients with suspected work-related cumulative trauma or repetitive stress disorders have evidence of other conditions that resemble, but are not carpal tunnel syndrome. A definitive diagnosis is often difficult. Most of these disorders require treatments similar to those used for CTS: rest, immobilization, steroid injections, and surgery if conservative treatment is unsuccessful. Repetitive work can cause pressure on the median nerve in locations other than the wrist and can also affect other nerves in the arm and hand. The branch of the median nerve that runs through the palm of the hand can be damaged directly by repeated pounding or by the use of certain tools that are gripped with the palm, such as needle-nosed pliers. The median nerve can also be pinched in the forearm. 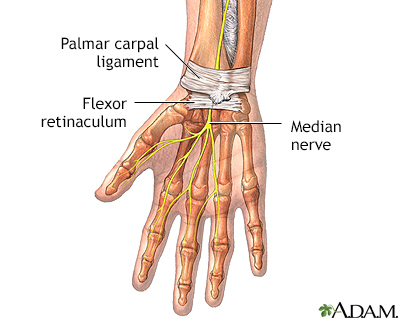 The ulnar nerve can, like the median nerve, be trapped as a result of repetitive stress. When this nerve is trapped, the condition is sometimes referred to as ulnar tunnel syndrome. It is also known as Guyon canal syndrome, because this is the name of the passage through which the ulnar nerve passes. General symptoms are similar to those of carpal tunnel syndrome, but patients experience a loss of sensation in the ring and little finger and in the outer half of the palm. Guyon canal syndrome can be a separate problem, although it commonly occurs with CTS. In such cases, release surgery for CTS usually also relieves the ulnar nerve entrapment. The ulnar nerve can also be affected at the elbow. Tenosynovitis is swelling of the slippery covering of the tendons that move the thumb. When it causes pain on the side of the wrist and forearm right below the base of the thumb, it is known as De Quervain's tenosynovitis. (Finklestein's Test may help identify this. Make a fist that encloses the thumb, and bend the wrist sideways and down away from the thumb. If it causes pain, it is likely to be De Quervain's tenosynovitis.) It may be treated with splints or corticosteroid injections. In severe cases release surgery is effective. Digital flexor tenosynovitis, commonly called trigger or snapping finger, is brought on when a tendon thickens, leaving the finger or thumb in a bent position. This disorder usually occurs when the tendons form a knot. It may be a problem in people with hypothyroidism, diabetes, gout, rheumatoid arthritis, or connective tissue disorders. Digital flexor tenosynovitis can cause pain and a clicking sound when the trigger finger or thumb is bent and straightened. It can be effectively treated with corticosteroid injections. Thoracic outlet syndrome is caused by the compression of nerves or blood vessels running down the neck into the arm. The compression occurs at the first rib in the front of the shoulder. This may happen after an accident or simply from repeatedly slouching. It can produce symptoms very similar to those of CTS. Other symptoms may include Raynaud's phenomenon (changes in sensation and temperature in the hand). A doctor may be able to diagnose the condition by detecting reduced blood flow in the arm as the patient raises the affected hand and turns his or her head toward the opposite side. Although the condition is uncommon, a correct diagnosis is important to differentiate it from CTS, since treatments differ. Surgery may be required to relieve pressure on the nerves and blood vessels. Cervical radiculopathy, or pinched nerve, in the neck can lead to the median nerve being more vulnerable around the wrist. The nerve can exhibit "double crush syndrome" where it was pinched near the neck and also again near the wrist. The nerve is more vulnerable to produce symptoms even with the compression at each site is not as severe. Neck physical therapy or nerve root injection or cervical disc surgery can elevate the symptoms. The doctor will perform a physical exam. The patient is asked, "What do you do when your symptoms are worse?" If the patient responds with a motion that resembles shaking a thermometer, the doctor can strongly suspect carpal tunnel. Can the thumb rise up from the plane of the palm? Can the thumb stretch so that its pad rests on the little finger pad? In Phalen's test, the patient rests the elbows on a table and lets the wrists dangle with fingers pointing down and the backs of the hands pressed together. If symptoms develop within a minute, CTS is more likely. (If the test lasts for more than a minute, even patients without CTS may develop symptoms.) This test may be particularly important in determining the severity of CTS and assessing the results of treatment. In the Tinel's sign test, the doctor taps over the median nerve to produce a tingling or mild shock sensation. Pressure Provocation Test. The doctor presses over the carpal tunnel for 30 seconds to produce tingling or shock in the median nerve. This test uses an inflatable cuff that applies pressure over the median nerve to produce tingling or small shocks. The patient raises his or her hand overhead for 2 minutes to produce symptoms of CTS. The test was has been proven to be accurate and may provide useful information when combined with the Tinel's and Phalen's tests. Electrodiagnostic tests analyze the electric waves of nerves and muscles. These tests can help detect median nerve compression in the carpal tunnel. Electrodiagnostic tests should be used if clinical or provocative tests are positive and the patient is considering surgery. These tests are the best methods for confirming a diagnosis of CTS. Doctors who perform these tests should be certified by the American Board of Electrodiagnostic Medicine, which uses rigorous standards in qualifying doctors. Specific electrodiagnostic tests, called nerve conduction studies and electromyography, are the most common ones performed. Nerve conduction tests can also detect other problems that cause CTS symptoms, such as pinched nerves in the neck or elbow, or thoracic outlet syndrome. To perform nerve conduction studies, surface electrodes are first fastened to the hand and wrist. Small electric shocks are then applied to the nerves in the fingers, wrist, and forearm to measure how fast a signal travels through the nerves that control movement and sensation. Nerve conduction tests are fairly accurate when done on patients with more clear-cut symptoms of carpal tunnel syndrome. They are less accurate in identifying mild CTS, however. Patients should be sure their practitioners perform tests that compare a number of internal responses, not just the responses of muscles located in the palm at the base of the thumb. They should also make sure the tests measure responses on the second or third fingers. To perform electromyography, a thin, sterile wire electrode is inserted briefly into a muscle, and the electrical activity is displayed on a viewing screen. Electromyography can be painful and is less accurate than nerve conduction. Some experts question whether it adds any valuable diagnostic information. They suggest that its use be limited to unusual cases, or when other tests indicate that the condition is aggressive and may increase the risk for rapid, significant injury. Although electrodiagnostic studies are frequently done to confirm the diagnosis of CTS in patients with classic symptoms, they are also performed on patients with symptoms that do not point to CTS as clearly. Doctors must interpret test results in these patients more carefully. Portable electronic devices are being evaluated for measuring nerve conductivity. They are relatively quick and easy to use on a large scale in an industrial facility. However, these devices have not been not well studied in clinical trials. Obesity can slow the speed of electrical conduction. Women and the elderly normally have slower conduction times than younger adult men. A diagnosis of CTS may follow testing the affected hand for numbness, tingling, weakness or pain in specific areas. Muscle and nerve conduction tests may also help affirm or rule out carpal tunnel syndrome. It is critical to begin treating early phases of CTS before the damage progresses. A conservative approach to CTS, which may include corticosteroid injections and splinting, is the first step in treating this disorder. The conservative approach is most successful in patients with mild carpal tunnel syndrome. If the initial treatment doesn't improve symptoms in 2 to 7 weeks, another treatment or surgery should be tried. Some patients may start with surgery if there is evidence of nerve damage. Studies suggest that surgery is a better option for severe CTS. Surgery improves function and symptoms better than splinting or anti-inflammatory drugs plus hand therapy over the long term. The improvements last for more than 6 months. Even among patients with mild CTS, there is a high risk of relapse. If possible, the patient should avoid activities at work or home that may aggravate the syndrome. The affected hand and wrist should be rested for 2 to 6 weeks. This allows the swollen, inflamed tissues to shrink and relieves pressure on the median nerve. If the injury is work related, the worker should ask to see if other jobs are available that will not involve the same hand or wrist actions. Few studies have been conducted on ergonomically designed furniture or equipment, or on frequent rest breaks. However, it is reasonable to ask for these if other work is not available. Nonsteroidal anti-inflammatory drugs (NSAIDs) may provide short-term relief of symptoms, but have not been found to help the basic problem go away. NSAIDs include common pain relievers such as aspirin and ibuprofen (Advil). Diuretics, magnet therapy, laser acupuncture, vitamin B6, exercise, or chiropractic care also do not help clear up carpal tunnel syndrome. Other approaches being investigated include omega-3 fatty acid supplements. It is important to treat any underlying medical condition that might be causing carpal tunnel syndrome. For example, reducing inflammation in rheumatoid arthritis or other forms of inflammatory disorders that directly cause CTS is very helpful. Hypothyroidism and diabetes are diseases associated with an increased risk of CTS. The treatments for such diseases may offer some relief for CTS symptoms. Wrist splints can keep the wrist from bending. They are not as beneficial as surgery for patients with moderate-to-severe CTS, but they appear to be helpful in specific patients, such as those with mild-to-moderate nighttime symptoms that have lasted for less than a year. Typically the splint is worn at night or during sports. The splint is used for several weeks or months, depending on the severity of the problem, and it may be combined with hand and finger exercises. Benefits may last even after the patient stops wearing the splint. Corticosteroids (also called steroids) reduce inflammation. If restricting activities and using painkillers are unsuccessful, the doctor may inject a corticosteroid into the carpal tunnel. In CTS, steroid injections (such as cortisone or prednisolone) shrink the swollen tissues and relieve pressure on the nerve. There is good evidence that they offer short-term symptom relief in a majority of CTS patients. However, in about half of cases, symptoms return within 12 months. Generally a second injection does not provide any added benefit. Another concern with the use of these injections in moderate or severe disease is that nerve damage may occur even while symptoms are improving. Corticosteroid injections are helpful for pregnant patients, as their symptoms often go away within 6 to 12 months after pregnancy. Most doctors limit steroid injections to about three per year, because they can cause complications, such as weakened or ruptured tendons, nerve irritation, or more widespread side effects. A short course (1 to 2 weeks) of oral corticosteroid medicines may provide relief for some people, but the relief does not usually last. Long-term use of these medications can cause serious side effects. Ultrasound uses high-frequency sound waves directed toward the inflamed area. The sound waves are converted into heat in the deep tissues of the hand, opening the blood vessels and allowing oxygen to be delivered to the injured tissue. Ultrasound is often performed along with nerve and tendon exercises. Ultrasound treatment appears to be effective in the short term, but its long-term benefit remains unknown. Very limited evidence suggests that yoga practice may provide some benefit for patients with carpal tunnel syndrome. Yoga postures are designed to stretch, strengthen, and balance upper body joints. Some experts have reported that people who are physically fit, including athletes, joggers, and swimmers, have a lower risk for cumulative trauma disorders. Although there is no evidence that exercise can directly improve CTS, a regular exercise regimen using a combination of aerobic and resistance training techniques strengthens the muscles in the shoulders, arms, and back; helps reduce weight; and improves overall health and well-being. Nonsteroidal anti-inflammatory drugs (NSAIDs), which include aspirin and ibuprofen (Advil), are the most common pain relievers used for CTS. They block prostaglandins, the substances that dilate blood vessels and cause inflammation and pain. However, there are few well-conducted studies to determine their role in CTS. To date, there is no evidence that they offer any long-term relief, and regular use can have serious side effects. Therefore, NSAIDs are generally not used for the long-term treatment of carpal tunnel symptoms. Some investigators are working with low-level laser therapy (LLLT), which generates extremely pure light in a single wavelength. The procedure is painless. However, 2 trials comparing laser therapy to conservative treatment or a placebo laser treatment found no real benefit from this therapy. Carpal tunnel release surgery is among the most common surgeries performed in the United States. In various trials, 70% to 90% of patients who underwent surgery were free from nighttime pain afterward. Studies have found that surgery provides a greater benefit over the long term compared with splinting or anti-inflammatory drugs plus hand therapy. Although evidence strongly suggests that surgery is more effective than conservative approaches (at least in patients with moderate-to-severe CTS), the decision about whether to have surgery to correct CTS, and when to have it, is not always clear. Electrodiagnostic and other tests used to confirm CTS are not always perfect or useful in determining the best candidates for surgery. As a result, surgery does not cure all patients. A number of experts believe that release surgery is performed too often. Some recommend a full trial of conservative treatment (such as splints, anti-inflammatory agents, and physical therapy) before choosing surgery. Others warn that CTS is often progressive and will worsen over time without surgery, and that surgery is better than splints and conservative measures for pain relief in cases where CTS is likely present. Performing heavy manual labor, particularly working with vibrating tools. Only slightly more than half of people who use vibrating hand-held tools are symptom-free 3 years after a CTS operation. Patients who are on hemodialysis have good initial success, but the condition deteriorates in about half of these patients after around a year and a half. Patients with diabetes and high blood pressure may be more likely to require a second operation. Patients have a work related injury that caused CTS. CTS surgery can be performed through a standard open release, a mini-open technique, or endoscopy. There is no clear evidence to suggest that one surgical technique is much better than another over the long term. Traditionally, surgery for CTS has involved an open surgical procedure performed in an outpatient facility. 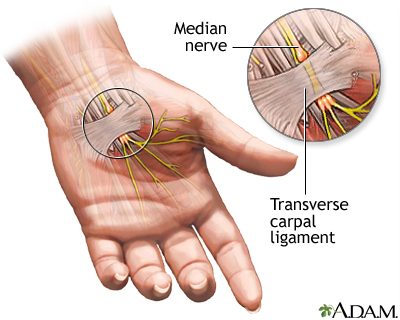 In this procedure, the carpal ligament is cut free (released) from the median nerve. This relieves pressure on the median nerve. The surgery is straightforward. In recent years, more surgeons have adopted a "mini" open -- also called short-incision -- procedure. This surgery requires only a 1-inch incision, but it still allows a direct view of the area (unlike endoscopy, which is viewed on a monitor). The mini-open approach seems to reduce recovery time, pain, and recurrence rate compared to an open approach. However, over the long term there doesn't seem to be any significant difference between the mini-open approach and the standard open release. Endoscopy for CTS is a less invasive procedure than standard open release. A surgeon makes one or two 1/2-inch incisions in the wrist and palm, and inserts one or two endoscopes (pencil-thin tubes). The surgeon then inserts a tiny camera and a knife through the lighted tubes. 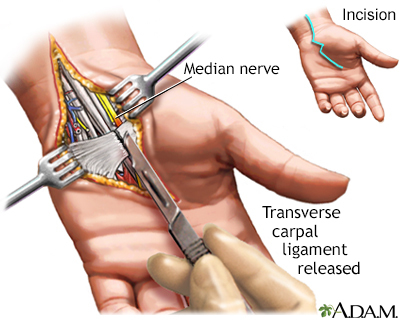 While looking at the underside of the carpal ligament on a screen, the surgeon cuts the ligament to free the compressed median nerve. Patients who have endoscopic surgery report less pain than those who have the open release procedure, and they return to normal activities in about half the time. Nevertheless, at this time the best evidence available does not show any significant long-term advantages of endoscopy over open release in terms of muscle, grip strength, or dexterity. The endoscopic approach may even carry a slightly higher risk of pain afterward. This may be due to a more limited view of the hand with endoscopy. (In the open release procedure, the surgeon has a full view of the structures in the hand.) Because of this reduced visibility, there are more concerns about irreversible nerve injury with endoscopic carpal tunnel release than with open carpal tunnel release. However, larger studies have shown an extremely low number of complications when the procedure is performed by experienced physicians. The difference in pain is also not that significantly different clinically. For some patients, release surgery relieves symptoms of numbness and tingling immediately. People who have the operation on both hands will need someone to help them at home for about 2 weeks. Returning to strenuous work right after surgery may cause the symptoms to return. Patients who work in strenuous jobs generally stay out of work for at least a month and often much longer, depending upon the type of surgery and the severity of the condition. Recovery time appears to be faster with endoscopy or mini-open release than with open release. People who perform light office work will return to work much sooner, although possibly with some limitations. Immediately after surgery, patients usually experience a decline in grip strength and dexterity. Studies have reported a wide range of recovery in this area. The scar may remain tender for up to a year. Peak improvement (the best level of improvement a patient can reach) may take a long time (up to 10 months). Physical therapy following surgery has not been shown to speed up recovery or affect the final outcome of CTS surgery. Treatment failure and complication rates of CTS surgery vary. Loss of some wrist strength is a complication that affects some patients. Some patients who have jobs requiring significant hand and wrist strength may not be able to perform them after surgery. These workers may also have problems in other parts of the upper body, including the elbows and shoulders. These problems do not go away with surgery and can persist. If pain and symptoms return, the release procedure may be repeated. Patients who had open release surgery appear more likely to require repeat operations compared with those who have had endoscopic surgery. Calandruccio JH. Carpal tunnel syndrome, ulnar tunnel syndrome, and stenosing tenosynovitis. In Azar FM, Beaty JH, Canale ST, eds. Campbell's Operative Orthopaedics. 13th ed. Philadelphia, PA: Elsevier; 2017:chap 76. Chung VC, Ho RS, Liu S, et al. Electroacupuncture and splinting versus splinting alone to treat carpal tunnel syndrome: a randomized controlled trial. CMAJ. 2016;188(12):867-875. PMID: 27270119 www.ncbi.nlm.nih.gov/pubmed/27270119. Graham B, Peljovich AE, Afra R, et al. The American Academy of Orthopaedic Surgeons evidence-based clinical practice guideline on: management of carpal tunnel syndrome. J Bone Joint Surg Am. 2016;98(20):1750-1754. PMID: 27869627 www.ncbi.nlm.nih.gov/pubmed/27869627. Huisstede BM, van den Brink J, Randsdorp MS, et al. Effectiveness of surgical and postsurgical interventions for carpal tunnel syndrome-a systematic review. Arch Phys Med Rehabil. 2017. PMID: 28577858 www.ncbi.nlm.nih.gov/pubmed/28577858. Kleopa KA. In the clinic. Carpal tunnel syndrome. Ann Intern Med. 2015;163(5):ITC1. PMID: 26322711 www.ncbi.nlm.nih.gov/pubmed/26322711. Padua L, Coraci D, Erra C, et al. Carpal tunnel syndrome: clinical features, diagnosis, and management. Lancet Neurol. 2016;15(12):1273-1284. PMID: 27751557 www.ncbi.nlm.nih.gov/pubmed/27751557. Page MJ, Massy-Westropp N, O'Connor D. Splinting for carpal tunnel syndrome. Cochrane Database Syst Rev. 2012;(7):CD010003. PMID: 22786532 www.ncbi.nlm.nih.gov/pubmed/22786532. Page MJ, O'Connor D, Pitt V, Massy-Westropp N. Therapeutic ultrasound for carpal tunnel syndrome. Cochrane Database Syst Rev. 2013;(3):CD009601. PMID: 23543580 www.ncbi.nlm.nih.gov/pubmed/23543580. Ronthal M. Arm and neck pain. In: Daroff RB, Jankovic J, Mazziotta JC, Pomeroy SL. Bradley's Neurology in Clinical Practice. 7th ed. Philadelphia, PA: Elsevier; 2016:chap 31. Sim H, Shin BC, Lee MS, Jung A, Lee AH, Ernst E. Acupuncture for carpal tunnel syndrome: A systematic review of randomized controlled trials. J Pain. 2011;12(3):307-314. PMID: 21093382 www.ncbi.nlm.nih.gov/pubmed/21093382. Vasiliadis HS, Georgoulas P, Shrier I, Salanti G, Scholten RJ. Endoscopic release for carpal tunnel syndrome. Cochrane Database Syst Rev. 2014;(1):CD008265. PMID: 24482073 www.ncbi.nlm.nih.gov/pubmed/24482073.